Georges watersports is a well-established business that settled operations 1989 in the small graphical harbour of Latchi. Latchi Harbour is located on the North West of the island and lies on a beautiful coastline and a panoramic peninsula. Georges watersports offer self-drive speedboats for hire, a great opportunity for YOU and your family to add a difference and excitement on your vacations. Our company offers people the opportunity visiting the wonders of Akamas and swim in the crystal clear waters of the famous blue lagoon. From the beginning of our operations the main objective was always the safety of our customers, and therefore we managed to build a great reputation on serving quality and difference. Our staff are Professional powerboat instructors which are responsible for your training before your departure i.e: driving and handling a speedboat, knowledge of sea regulations and usage of safety equipment in case of emergency on board. (lifejackets, coastal map, parachute flares, medicine box, fire extinguisher, navigation lights, VHF radio communication, water pump) Including the rental price, we offer cool boxes to keep your beverages and food cold, masks and snorkels and fishing equipment. Our standard line of speedboats consists of 50 & 60 HP speedboats 5.3 meters long. Price range for these range from 25 to 30 euro per hour for a four-hour hire. Shower Sundeck Stereo Watersports Pylon Removable Table W.C.
Latchi Watersports Centre is located at the footsteps of the idyllic Akamas National Park. What better treat during your stay in Cyprus than by exploring these calm, crystal clear waters with one of our superb self-drive boats. Cypriot regulations certainly help anyone looking for boat hire in Cyprus. As a tourist, you may hire any powerboat of up to 10 metres with just a car driving licence. So don’t forget to bring it with you! 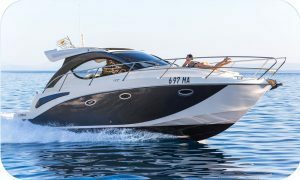 We have a wide range of self-drive powerboats (Boat Hire) available, from 5-metre 40hp speedboats right up to 8.6-metre luxury Italian 250hp boats. These include features such as mp3 stereo (iPod compatible), fresh-water shower, on-board toilet, small cabin and storage space. And, ALL boats come with a large retractable sun-shade and snorkelling equipment for all passengers is included. Additional items, such as water skis, wakeboards, towable inflatables, kneeboards and fishing rods are available for hire upon request. A full briefing of the coastline and the boat is given to customers before departure, as well as a taxi service in and out of the harbour. Our coastline is rich in history, each bay has its own fascinating story, from Venetian harbours to old shipwrecks. There are also secret caves and white sandy beaches to discover, and as for the famous Blue Lagoon… well, that’s a paradise that any local will tell you about! So whether you take a picnic and make a day of it, or simply relax with a glass of champagne and watch the sunset over the horizon, our boat hire is a must-do whilst visiting Cyprus. Latchi Watersports Centre is located at the footsteps of the idyllic Akamas National Park. What better treat during your stay than exploring these calm, crystal clear waters by boat. The Cypriot regulations certainly help this dream, as a tourist, you can hire a powerboat up to 10 metres with just a car driving licence. We also offer guided trips for those who prefer to relax and let others do the work! Hire a boat for an Hour or Two, for a Half Day, or be a Captain for the entire Day. Only at Latchi Watersports Centre, Cyprus. We have a wide range of powerboats available, from 5-metre 40hp speedboats right up to 8.6-metre luxury Italian 250hp boats. These include different features such as mp3 stereo (iPod compatible), fresh-water shower, on-board toilet, small cabin and storage space. All boats come with a large retractable sun-shade and snorkelling equipment for all passengers is included. Additional items, such as water skis, wakeboards, towable inflatables, kneeboards and fishing rods are available for hire upon request. A full briefing of the coastline and the boat is given to customers before departure, as well as a taxi service in and out of the harbour. The coastline is rich in history, each bay has its own fascinating story, from Venetian harbours to old shipwrecks. There are also secret caves and white sandy beaches to discover, and as for the famous Blue Lagoon… well, that’s a paradise that any local will tell you about! So whether you take a picnic and make a day of it, or simply relax with a glass of champagne and watch the sunset over the horizon, boat hire is a must-do whilst visiting Cyprus. All Boat Hire & Charters Latchi Polis Cyprus are equipped with VHF, medical box, flares, canopy, electronic start, life-jackets, snorkelling equipment, coolbox and local coastal map. Those with no previous boat experience are given a full briefing and basic training before departing for their trip. Being a large company we also have a beach base along the coastline, and a safety boat and a dive boat available, so we can get there quickly should assistance be needed. We have 3 bases along the coastline as well as a safety boat in the area making sure our customers are 100% at ease. Experience luxury, freedom and elegant sailing with this 2014 yacht designed by leading racing architect, Bruce Farr. Great for both sailing enthusiasts and families looking for a fun day out, the Bavaria has a large deck area and a modern spacious saloon. Above deck, there is a roomy cockpit / sociable area with plenty of seating space. The twin helm design means better all-around visibility easy and safe access to the stern of the boat. This can be lowered to reveal a huge swim platform, complete with ladder. The cockpit table can be extended to provide a beautiful outdoor dining area, complete with cup holders. Other design features include extra handrails for safety and extra hidden storage spaces for equipment or accessories. For those wanting a more hands-on experience, the sleek design means the boat is fast on all points of sail and laid out for easy and efficient sailing. This, with a cockpit featuring clear and integrated chart plotter and control panels, and a clean, practical deck design has won the boat many 2014 award nominations. The interior of this boat is light and spacious. It is designed with extra headroom and many windows and hatches to keep it bright and ventilated. It’s suitable for both corporate groups and families with young children. There are three double cabins, one with ensuite, and one main bathroom (head). The yacht is brand new and fully equipped with safety equipment, galley, domestic appliances and fresh linen for overnight stays. The skipper on board is fully licensed and very experienced. Escape from the everyday and taste the pleasures of family cruising. With three cabins, a spacious saloon and a very functional galley, the Sun Odyssey proves both well designed and luxurious. High-quality woodwork accents an incredibly bright, well-lit interior. While this boat also features a shoal keel enabling easy access to the Akamas lagoons, the charter price is significantly lower than our larger Bavaria 41. Licensed for 8 passengers. Designed by Marc Lombard and true to the values of the Sun Odyssey line, this 2016 design is the perfect combination of performance, comfort and safety at sea. The twin rudder design enables exceptional control at every sailing angle, increased safety at sea and reduces vulnerability when in shallow areas. The cockpit features a twin helm design for easy movement and improved visibility whilst sailing. The stern of the boat can be lowered to reveal a large swim platform with ladder. Whether in the cockpit or at the helm, at anchorage or at sea, you will enjoy taking full advantage of this seaworthy, stable and easy-to-handle sailing yacht. The Sea Ray 52 Charter is a classy elegant craft is equipped with everything you need for a memorable yacht charter. It is ideal for a family day out or small corporate meeting. The Sea Ray 52 Charter features a streamline and distinctive exterior with a bright inviting interior. The large cockpit features a seating lounge with table and huge swim platform. Perfect for relaxing in the beautiful Cyprus sunshine!. Upon the flybridge, there is an additional seating area with table, with amazing views from behind the helm. The interior of this boat is spacious and receives lots of natural light. The roomy saloon is fully airconditioned with entertainment system and an open galley with plenty of work surface and storage space. The dining area is air-conditioned, with wrap-around seating and a large wooden table. This boat sleeps 6 people in three cabins. The large master bedroom has an en-suite. The maximum capacity of this boat is 20 people. Choose between morning or afternoon. Cruise along the coast, swim and snorkel in the beautiful bays of the national park. Enjoy lunch onboard. A half day charter is classed as 4 hours. Lose yourself at sea for a day of relaxation and serenity. With various destinations available, the charter itinerary is up to you. Plenty of time for swimming, snorkelling, dining, sunbathing. Or for the more active, time to expand your knowledge of sailing and boats. You’ll want to stay out there forever! A full day charter is classed as 6 hours, but this can be extended by the hour. Whereas most sailing yachts above a certain size will usually have an inboard engine, they will not be “motorsailers”, as their principal source of power is sail, and the engine is only for an auxiliary drive. This trip can be done any time of day, but we recommend early mornings, as this is the best time for fishing. The sea at this time is usually very calm. Fishing equipment is supplied. A fishing trip is normally three hours but can be extended if required. You suggest the destination and duration and we can do the rest. The possibilities are endless, and we are very flexible with what we can provide. Perhaps you want to combine the view and the sport, by going fishing at sunset. Maybe it’s a birthday party or corporate event. You may want to have two jetski’s available for you and your mates. Or banana rides for the kids. Contact us to discuss and we can completely personalize your trip. All yachts through Latchi Yacht Charters Cyprus are fully equipped with safety equipment, galley, domestic appliances and fresh linen for overnight stays. The skipper and crew on board are fully licensed and very experienced. To add something special to your charter, we can provide a full range of watersports activities and scuba diving equipment. Fully licensed diving instructors can also be present on board. Jetski’s and waterski boats can be available throughout the charter. Catering packages can be provided if required. Please note all the prices for Boat Hire & Charters Latchi Polis Cyprus were correct at publication, changes and omissions are expected. Maispa Developers holds no responsibility to any changes.